Only £15.75 (Approx $23 USD) for both utilities. 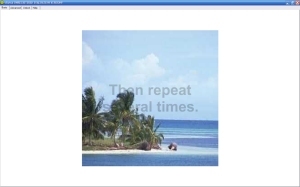 Problem: Visual NLP techniques such as the Swish technique are reliant upon the imagination of images and concurrently associating feelings with the images. The problem is that many people find imagining images and feelings difficult at best. Also, given the nature of the technique it is very easy for therapists and patients to lose their place in the process. Solution: Our software based approach resolves these problems by providing images on-screen that can reduce the need to imagine and enables easier generation of images after treatment. Sound effects help feelings to be associated into more easily and more rapidly. On-screen instructions guide you through the process to keep treatment on-track. 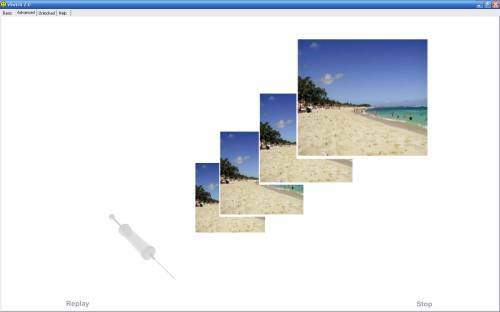 We provide a generic solution with preset images and enable you to provide your own images / sounds if required. For sufferers: The NLP Swish pattern helps you to change your state of mind - it helps you to move from one mood state into another quickly and easily. Change negatives into positives, convert anxiety into calm. For therapists: This multimedia software approach helps you by showing your patient's exactly what they should imagine. Your patients' can then continue the process in their imagination or you can use the software to guide them through the process. Swish (Lite) contains two versions within the same product. A basic version and slightly more advanced version. Swish Lite Basic: The "lite basic" version is a simple implementation of the Swish technique with static images and sounds. The user is guided through the use of the technique via on-screen instructions. Swish Lite Advanced: A new minor version of Swish Lite was released on 1/May/06 to enable external images to be specified if required rather than using the defaults. This satisfies the needs of more advanced users that want simplicity and flexibility. (PC/MAC) The PC version module includes German / English language support. 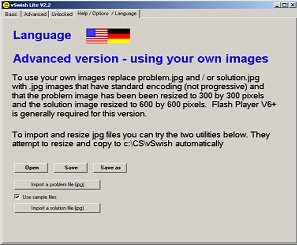 5 June 07 - A new version of Swish Lite Advanced was released on 5 June 07 (1.7 MB download / PC only) that provides a very easy one-click way of importing and resizing images from your hard drive (standard jpg image files). 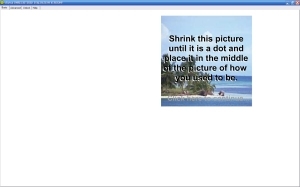 Your own images appear after the initial Swish pattern training dialogue. A "skip intro" option was also added to skip past the initial training dialogue and the quality of the image as it zoomed back from the horizon was greatly improved. V2.2 - 28 Jan 2010 - German language support added. Applies to the Advanced module only. Ability to save / reload settings included. Unlocking window improved visually and a new function to send user reference codes automatically by eMail has been included. The following screenshot relates to the PC version only. Users wishing to generate a version of this product in their own language can do so so long as they agree to share the translation with other users via an inbuilt upload facility. An inbuilt editor similar to Excel allows the text to be edited and previewed quickly and easily. An agreement needs to be accepted prior to being given access to these facilities. Language categories defined to date are Arabic, Bengali, Bulgarian, Catalan, Chinese Simplified, Chinese Traditional, Croatian, Czech, Danish, Dutch, English UK, English US, English, Filipino, Finnish, French, (German-translated), Greek, Gujarat, Hebrew, Hindi, Hungarian, Indonesian, Italian, Japanese, Kannada, Korean, Latvian, Lithuanian, Malay, Malayalam, Marathi, Norwegian, Oriya, Persian, Polish, Portuguese Brazil, Portuguese Portugal, Romanian, Russian, Serbian, Slovak, Slovenian, Spanish, Swedish, Tamil, Telugu, Thai, Turkish, Ukrainian and Vietnamese. Other categories can be added on request. If you translate into one of the most common languages and we accept the translation as being of high enough quality you will get your purchase fee for this product refunded. This applies to Spanish, Chinese and French translations at the current time. The "pro" version is a more advanced implementation of the Swish technique. The user now has the ability to use any images, any sounds and to save / restore settings. Speed, image size, background colour and image location settings can also be altered by the user. There are no on-screen instructions therefore the therapist is expected to explain the process to the client. Click on the image to the right to see the available options. Swish Pro is provided free of charge with Swish Lite. V1.1 - A new version of Swish Pro for PCs was released on 1/May/06 (V1.1) which takes Swish Pro unofficially out of 'beta test' mode following another phase of routine development. 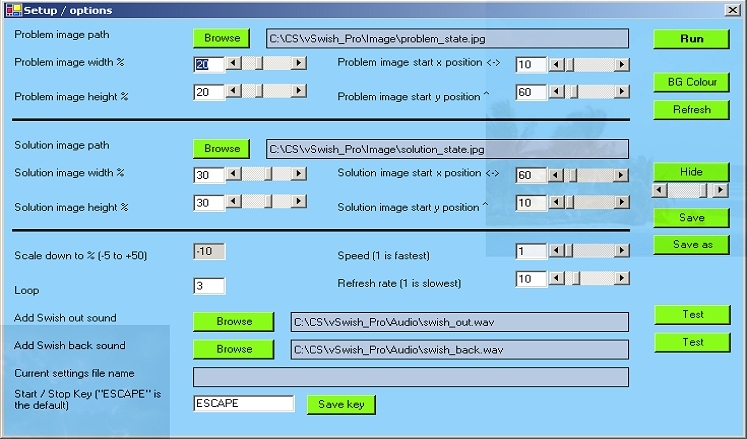 V1.4 - A new version was released on 28/Aug/07 (V1.4) to include using the Escape key to stop motion / sound and the control key to restart motion / sound. Sliders have been added for width / height settings. V1.5 - 30 Sept 07 - integration with shared image / audio library, instantly see the effect when adding images without needing to click on "Apply"
The modalities of the positive are amplified, the modalities of the negative are minimised as left to right matching auditory stimulation is provided. Swish Pro (PC only) is the same as the above except that user dialogue is not present. This allows the therapist to guide the user through the process in whatever way the choose. A more limited Mac version is also available. (English language support / no sample files - does include the advanced version). (See below for full description). What do Swish Lite and Swish Pro look like? Yes. In the Lite and Pro versions you can save settings using your own filenames eg "Confidence"
Can you choose any images you want? Yes. In the Lite version it has to be a jpg file, in the Pro version you can use a variety of other formats including bitmap (bmp) gif etc. In both versions you don't need to resize the source images - this is done for you automatically by either product. In the lite version this just alters the default images that are used whenever the program opens. Is there a archive from which any images might be selected? With either version a library of images is not supplied unless you additionally request the installation CD (there is a small additional fee for the CD). There is a very large image / audio library on the CD. If you order EMDR Pro you also get access to a substantial subset of the images / audio on the CD via the web. Swish Lite - more advanced version - at what stage do my images appear? After the initial Swish Pattern training dialogue. Click on "skip intro" to go directly to the part where your images appear. The Pro version is a semi-beta product that is bundled with the lite product. Beta means that development is ongoing but that enough has been done for the product to be usable. Future development may improve the user interface and will have more sliders to control image positioning etc rather than specifying the values in digits which is the case at the moment. The most commonly used fields have sliders at the moment ie width and height. The remainder will probably be actioned over time if there is user demand. 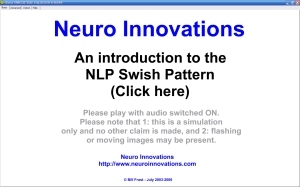 How do use NLP Swish? Dynamic TFT is primarily intended for use in any situation where it is advantageous to change mood states. It may therefore be useful with the treatment of panic attacks / agoraphobia, the treatment of phobias and fears, the treatment of addictions and habits and in the treatment of trauma / PTSD. As of Mar 06 MAC specific version available. The Mac version is simpler than the PC equivalent. The ability to select and automatically resize external files via the application is not present in the Mac version. 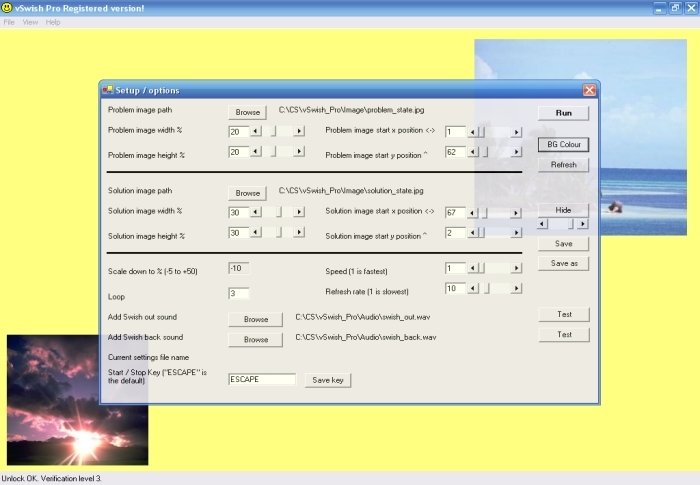 The same effect can be achieved by copying, renaming and resizing the external files manually (See below). 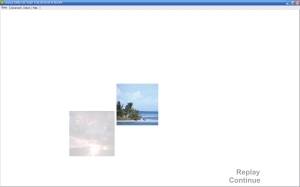 Copy two files named problem.jpg and solution.jpg and sized 300 by 300 pixels into the same folder as the more advanced version. How much do they cost? How do I get them?